With the release of iOS5, came many smart options which made using iPhone very simple and also loaded your iOS device with new features like notification center, itunes wi-fi sync and iCloud. Though after the release of iOS5, user were given the option to sync their iPhone or iPad or iPod with iTunes without even connecting the device to computer but for upgrading their phone software to iOS5 they had to connect the device to computer using the USB cable. New update for iOS5 is available which as per Apple will also fix battery issues faced by many users. Not only this, now to upgrade your phone to this newer update(iOS 5.0.1) you don’t even need to connect it to iTunes. Yes, for the first time, Apple now allows you to update your phone software to iOS 5.0.1 directly from your phone settings. Below are the steps that you can do to the perform the update. Go to Settings > General > Software Update. Here you will see the update for iOS 5.0.1 with the details of the issues fixed with the new update. Now click on Install button at the end of this screen. It will ask you to agree to the terms and conditions. Just click “Agree” and it will start installing the update on your iPhone/iPad/iPod. If you have a good internet connection then it won’t take much time for the update to get installed. 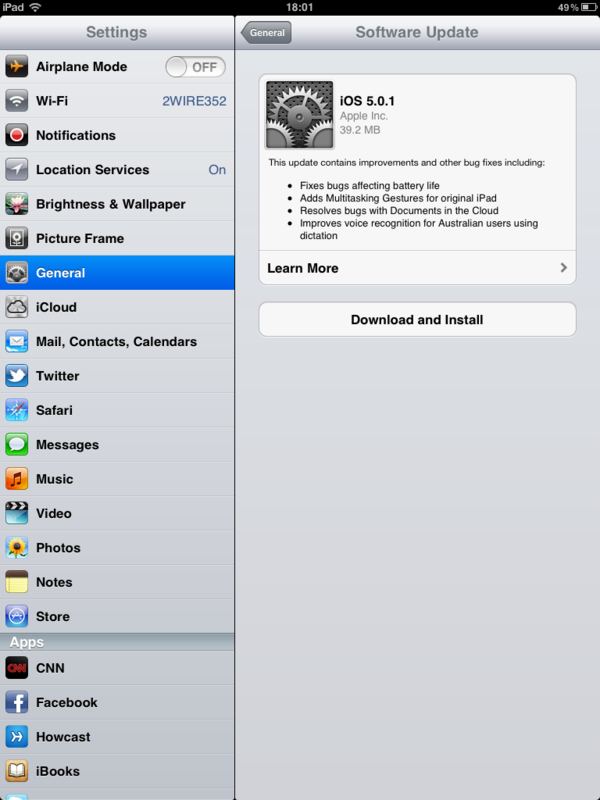 When I updated my iPad to iOS 5.0.1 , it took almost 4-5 minutes for the software to get installed. Apple recommends users to have their iOS device to have a minimum charge of 50% before starting the update. Those users who have problem with 3G or don’t have access to wi-fi, they can also update their phone by simply connecting it computer and then update using iTunes. It might take more time to update via iTunes because the update software for iTunes is much larger in size than the update which is available on the phone. I would recommend to update your iPhone, iPad or iPod using this new feature as shown above.